As a magician, this could be one of the most important reports you will ever read. It could save your career, your reputation and most importantly, your hard-earned money. This was written by a magician for magicians. Identity theft and hacking into accounts have become a major problem. Every week, you see on the news where some major corporation or celebrity's email account was hacked into. Even the FBI had their account hacked. No one is safe, as even magicians and magic sites have been hacked into. A person can hack into your social media and make posts pretending to be you that will ruin your reputation as a magician. You see this all the time on Facebook, magicians saying their account was hacked. Don't let this happen to you. Hackers can steal your email password and use it to send out spam to all of your friends. Several times, I have gotten emails from well-known magician friends whose e-mail accounts have been hacked. They say they are on vacation and have been mugged and begging me to wire them money. This is actually a well-known scam for which many people have fallen. Magicians are supposed to be some of the smartest and cleverest people in the world. Yet, most magicians are not being clever when it comes to passwords. They have poorly chosen passwords that a hacker can crack in minutes if they desire. Most magicians use the same password on every website. Once a hacker gets the password, he can access all your accounts and even clean out your bank account. What is the solution? Simple, have a different uncrackable password for every website you have accounts with and be able to remember them all instantly, without having to write them down, refer to a list or use password management software. Sounds like a tall order, yet it is so simple that you will be amazed. Devin Knight created the I've Got Your Number trick, that allowed you to give out thousands of different 4-digit numbers to different people and yet be able to recall the number, even if the person came up to you 20 years later. 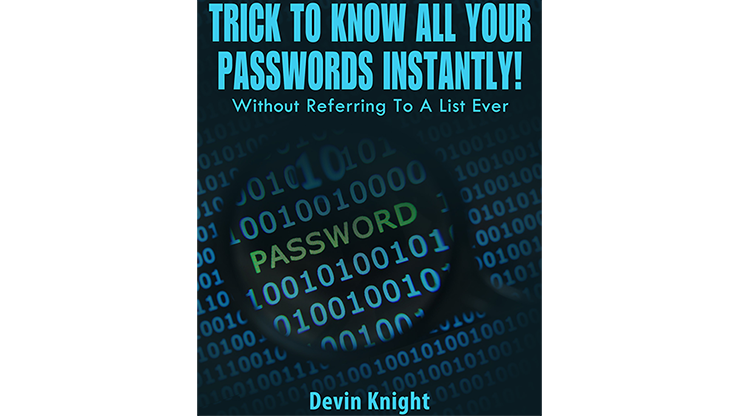 Devin thought to himself, if he could invent that, then why not come up with a simple trick that would allow you to create uncrackable passwords and remember them all without using a password manager such as Last Pass or Robo-Form. He did just that and developed an easy-to-remember trick using a famous magician's name that allows you to create an uncrackable password in seconds WITHOUT USING MATH CALCULATIONS or memorizing a complex memory system. You read that right; you can create an uncrackable password in seconds that defies brute force attacks. Many hackers are able to crack passwords using the Brute Force Method. There are software programs that allow a hacker's computer to try 8 million or more possible passwords in just a second! A brute force cracking application proceeds through all possible combinations of legal characters in sequence. Brute force is considered to be an infallible, although time-consuming, approach. How good is this secret? Well, using Devin's method, you can create a password in your mind in seconds that would take over a TRILLION years for a computer to crack running brute force software! In other words, your password is uncrackable! You do this for all the websites you visit, creating a different password each time. The cool thing is that you will never forget the password; you will remember it forever, even if you only visit that website once a year. Never again will you have to hit the Forgot Password button! This trick works, and you can instantly remember different passwords for hundreds or even thousands of websites without using a complex memory system. Devin instantly knows his passwords for over 2000 websites and they are all different, yet he does not refer to a list or use a password manager. You can do this too, and learn how to do it in a few minutes. This is one of the cleverest secrets you will ever learn, and it is something you will use to protect yourself. This eBook also explains how to create a username that says you are a magician and yet is unique and one you can be assured that no one else is using. It will also give you a link to a site that allows you to check every social media site and verify that your username is unique in just a few seconds! This information alone is worth the price of this report. In the Appendix is a list of the 500 worst passwords that almost everyone is using. Check your current password against this list and see if yours is listed. All hackers try these passwords first. Consider this eBook as an investment in your career. Get this before your identity is stolen, your accounts hacked into and your magic career ruined. Hackers can do this if you have a poor password. You will NEVER hit the Forgot Password button again. Priced low, so as many magicians as possible, can have access to this valuable information. Although this eBook was written for magicians, anyone can use this information to protect their identity, bank accounts and website logins.